Being a Spanish colony for three centuries (333 years, right? 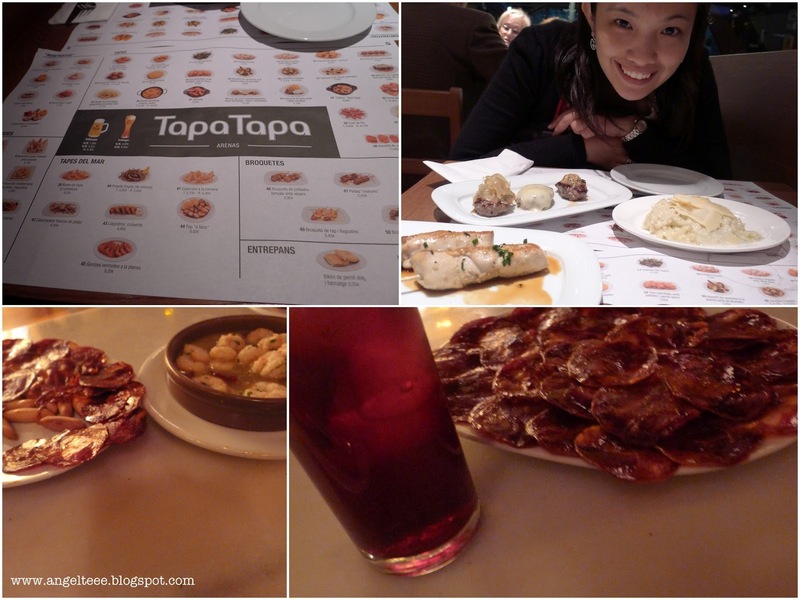 ), we sure had our taste our Spanish food. Our language, food, practices, had been so much molded and influenced by the Spaniards that traveling and going around in Spain had been an experience which felt closer than home. But this time, let me focus more on the food... I think gastronomic experiences deserve a separate blog post. Generally, I'm a picky and safe eater when ordering from restaurants and new places. I'm most of the time boring and predictable when it comes to my choices, J is the adventurous foodie who gets to try something new every so often (and I just taste his order, that makes me semi-adventurous, I guess?). I usually base my choices on the description of the menu, cross my fingers it'd turn out fine and order it again if I liked it. The biggest challenge for me so far had been eating out in a foreign country because often that not, there aren't English menus, so it's just basically a game in itself - figuring out what the menu meant, choosing what I hope it is, and if you're "lucky" - communicating with staff who spoke so little English. While some menus have pictures and you just get to point this and that (and silently hoping you're not eating frog or something overly exotic), most of the time it's just a good old "lost in translation" experience. Trust me, it brings out the creativity - one time in India, we had to resort doing the "Mcdonald's sign" by arching our two hands over our heads, silently hoping that forming that "universal M sign" would get us to the nearest McDonald's. I bet most travelers go through this ala Charades experience among other "memorable" ones. This makes me realize that aside from the other travel preps we do, it is equally important to be armed with a few words and phrases pertaining to food (on top of the usual "toilet", "exit", "entrance" words) considering that you'll be eating out while traveling - that, unless, you brought and packed your meals with you too. 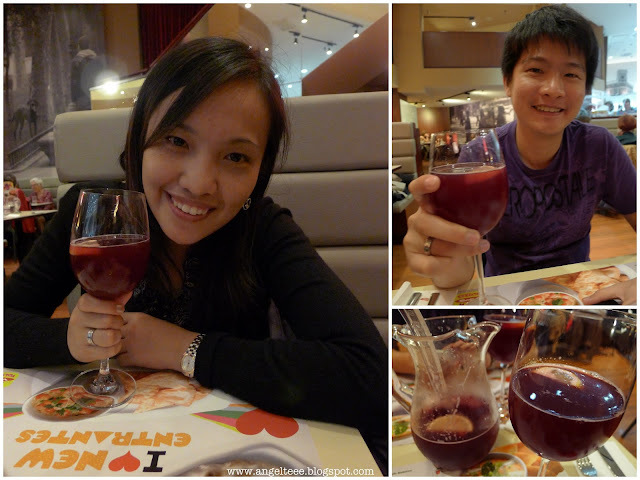 My love affair with Sangria began the first night at Madrid (and our first meal). ola (it's soo good i had to speak in Spanish! ), lo and behold - Spanish Sangria rocks! I don't drink wine often though i am more of a wine drinker than any other alcoholic beverage nowadays. and if I do drink wine, it had to be sweet - sparkling wine, Moscato, and now - Sangria! Sangria has a tinge of fruit to it and I'd been having it every meal in Spain - that's how much I liked it! I went further than that too, we scurried the grocery stores (in Spain and finally found it in Barcelona) to find an authentic Sangria bottle and took it back to Singapore! It was worth the luggage weight, I tell you. But since it was just one bottle, we had to drink in such little amount (not sips, thankfully) to make the one bottle last. haha! tipid-mode galore. Another Spanish treat - the paella! Who knew paella comes in many forms and varieties? 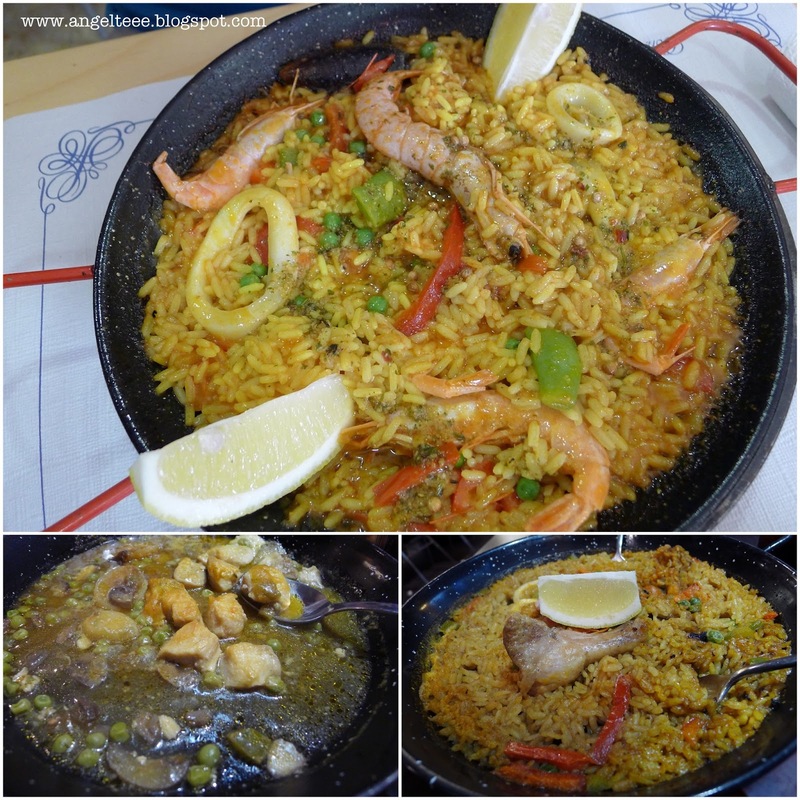 The paella originated in Valencia, located at the East coast of Spain. I heard the paella's really good down there. Nevertheless, since we only went to Madrid and Barcelona, then I'd have to say the paellas we tasted have to do. After all, it's still Spain, right? 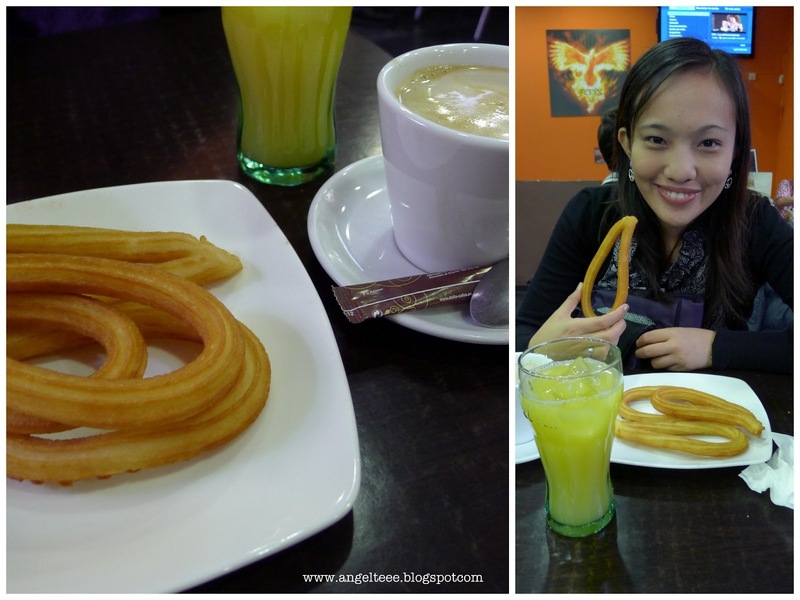 Spanish breakfast - churros! The churro is the Spanish version of a doughnut, which is a fried-dough pastry usually dipped in chocolate or coffee with milk. The chocoholic that I am - I had mine with chocolate, of course! 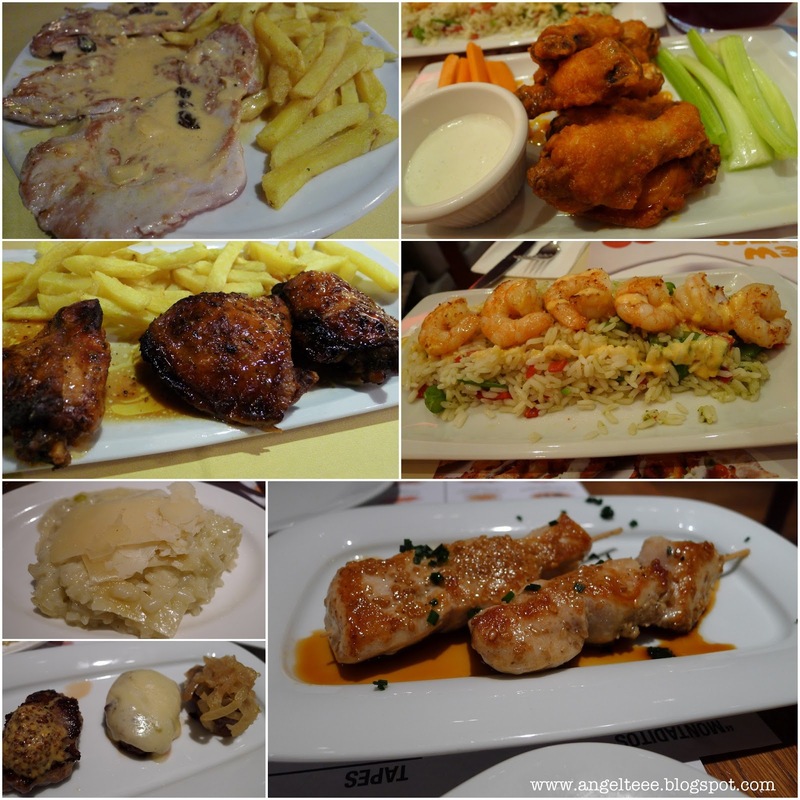 Just when you thought you've had it all, the restaurants in Spain will never fail to satiate you. J and I chanced upon Sedna restaurant in Barcelona which offered traditional Spanish/Mediterranean cuisine and boy, were we very happy with our food! 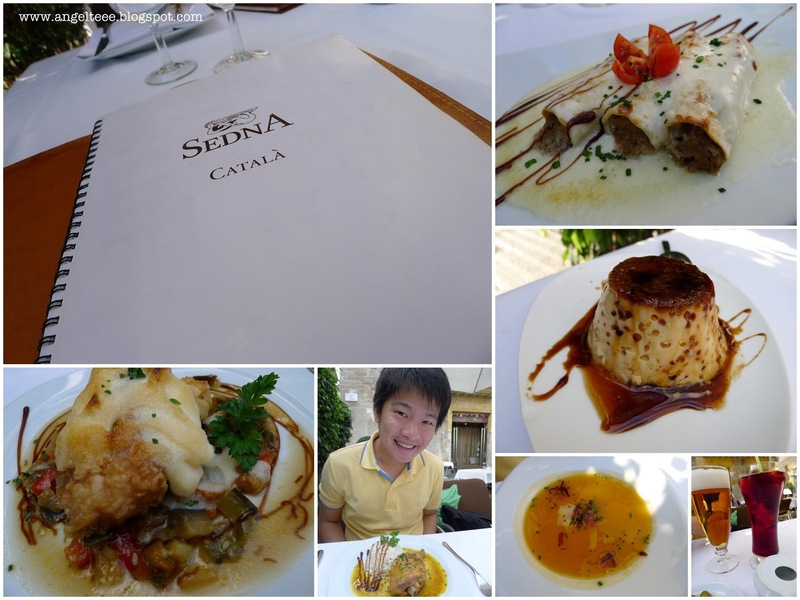 The misconception was that I thought Spanish food and cuisine had been something I had already tried. Nada, nothing new.. But then, I was wrong - nothing beats the real thing, plus, I experienced a whole set of new dishes too. This is as authentic as it gets, and a feast for the senses, definitely.